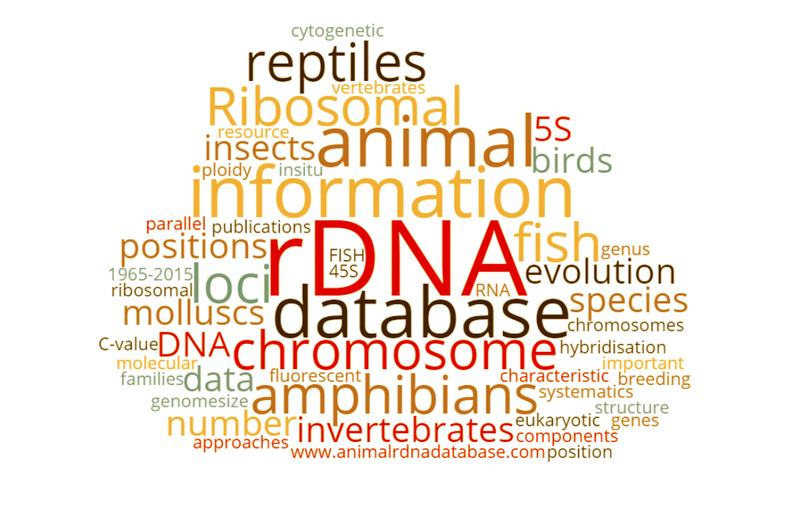 Welcome to the animal rDNA database (Release 1.1)! Ribosomal DNA loci encoding ribosomal RNA genes (rDNA) are important components of chromosomes. They vary both in numbers and positions. These can be characteristic of a species or a genus and used for comparative purposes. For example, studies in evolutionary biology, systematics or animal breeding. To make easily available this information we have constructed the animal rDNA database. The resource includes data for 1343 animal species from 264 families. It provides information on number, position and structure of rDNA loci. When available, it also offers data on ploidy level, chromosome number or genome size. It is parallel to the plant rDNA database, providing the same information for plants. The data of this first release comes from 541 papers based on FISH* of 5S and 45S rDNA, published until the end of 2016. NOTE: The database is not providing any rDNA sequence, only information about rDNA site number and position in chromosomes. If you are interested in sequence data, you can consult other databases listed here.